Lunch Break - What Are Your Favorite Family Movie? Lunch Break – What Are Your Favorite Family Movie? What movies are you excited to share with your kids? 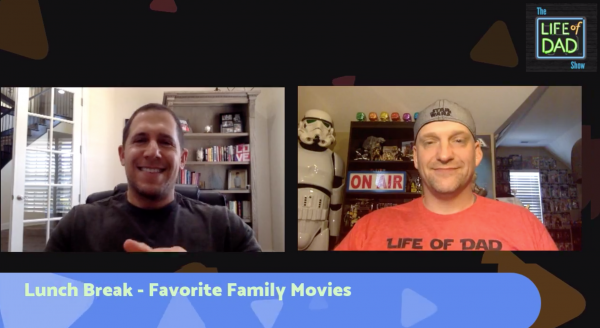 The Lunch Break hosts, Art Eddy and Jon Finkel share the movies that they couldn’t wait to share with their kids. Jason G. Simmons · My girls love all the princess movies..when they get a bit older i want to watch Princess Bride with them. Mark A Volberding · Can’t wait to share Star Wars with my son- especially Empire Strikes Back to see his reaction re:Luke/ Vader. Yermaun Steve · Hay guys, big shout from Northern Ireland, 18:00 here. 2 and 3 yo girls in our house anything with princesses is a win!